He's a busy bloke of late, after completing work on the Cranston album, late last year, with his latest solo album (this one) now released, plus the forthcoming Legion album which is just around the corner. Phil handles mostly everything again, with Dirk, Vince and Pete adding their contributions. I like the meaning of the album cover, old humanity represented by a skeleton, the new humanity represented by an AI looking synthetic being. It's quite timely considering all the changes going on in the world at the moment; the planet is on the verge of change. So what does Phil know that we don't know? From the outset, I'm astounded by the heaviness displayed on 'Broken'. The guitars are are as heavy as horses, the aggression and focus all too obvious. Good stuff! There's a bit of tippy-tap piano on second up effort 'Back In The Day'. The guitars are still amped but this is a few rungs down on the intensity level. 'What Might Have Been' is a very different approach, assuming a late 90's dance/trance back-beat. Not quite sure it works but kudos for giving it a try. 'Nobody's Gonna Miss You' returns PV to a familiar strain of melodic hard Rock, with lots of guitar noodling contained within. 'Waste Of Time' starts out as a power ballad in the making. Supplemented by thick sludgy guitar riffs, it gradually increases in power becoming more of a potent rocker by songs end. 'Caught In The Act' is another track to assume a poppier identity judging by the keyboard and rhythm work. Personally I think this combinationof styles within a rock context doesn't quite work. Much better is the straight-up hard rock of 'Long Way Down' followed soon after by the grinding low tempo rock of 'Time Will Tell'. The ninth track entitled 'Untitled' is a Beatles like jangle, the odd-man-out track on the album, 'Prima Donna' is more of the trademark PV melodic rock sound, though much like the first track, a touch heavier than what we're familiar with. 'Never Enough' follows the path set by the two previous tracks with a dance/pop back- beat, though to be fair the synth works makes it sound more like an 80's AOR track. To ensure the album doesn't completely lose its identity, we're given some hard crunching guitar work on the closing title-track 'Hypocrite', which stomps along in a brash and brazen fashion. Take a listen to the harsh vocal delivery on the chorus! 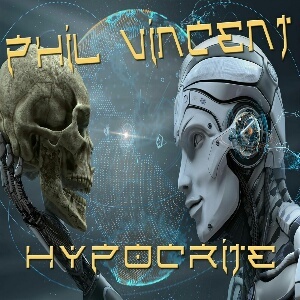 'Hypocrite' would rank as one of Phil's more diverse albums, and it would need to be too given his involvement with all his other band projects (Legion, Tragik, D'Ercole, Cranston). I would say that not everything delivered here is convincing, but the fact that it is different ensures there is no same-old sameyness throughout. Next up (as mentioned above) is the new Legion, we will probably get to that in the next wee while. All written content on this website belongs to GloryDazeMusic.com copyright. Duplication elsewhere on the Internet is strictly prohibited, unless specific permission is granted. Some similarity with the album cover to the latest Dream Theater album 'Distance Over Time'.